Teacher Appreciation Printables and Gift Ideas are the thing we moms all need! We love our teachers, but sometimes we lack the time or creativity to come up with something that shows how much we appreciate all they do for our children... that's why we compiled this nice list of Teacher Appreciation printables for you! Coming up with gift ideas for teachers is hard. What do teachers even like? Books? Food? Hand lotion? Who knows! That’s why buying gift cards for teachers is the safest bet, and it’s also super easy. However, a plain old gift card is a bit boring, so to spice up your gift a bit, we’re going to show you some awesome teacher gift card holder ideas. Also, these gift card gifts work all year round, they’re good for a quick holiday gift, end of the year present, or teacher appreciation week gift. Some more great things about these free gift card holder printable projects are that they’re so easy to whip up, and they look so good! There are also 7 different ones for you to choose from. This is really up to you, but I think anywhere from $5-$20 is perfect! No matter what amount you choose, the teacher will just appreciate the gesture and they’ll love the cute gift card holder. If you’ve been following our blog, you know there are tons of ways to utilize an Amazon gift card. The options and deals are endless! So, naturally, an Amazon gift card is always an awesome gift choice in my eyes. (Free one-day shipping on Amazon gift cards too!) I spent hours figuring out how to make whipped up this gift card holder printable to give to my child’s teacher and I’m sharing it here so you can use it too if you want! Print this 5×7 Amazon gift card printable on cardstock paper. Cut it out. Then adhere the gift card to the card (I just used removable double sided tape). Then you can write your name at the bottom, or have your child write their name, or write a message on the back. Whatever you prefer. Jazz it up even more by tying a ribbon or twine around the card. If there’s a Starbucks nearby, your teacher will love this gift. Starbucks offers all sorts of drinks, pastries, and sandwiches. This printable teacher Starbucks sleeve is so stinkin’ cute and a gift card fits perfectly inside the cup. Simple and cute Starbucks gift card printable that can be used for any occasion! Think of all the things a teacher could use an iTunes gift card for: apps, books, movies, TV shows, and music! An iTunes gift card printable for those teachers that rock! An awesome and fun variation of another iTunes gift card printable. Another super cute iTunes gift card printable for a teacher! A Barnes & Noble gift card might be right up the alley of your teacher if they love books and bookstores. We all love going out to eat every once in a while, right?! Give the teacher a night out to enjoy with family or friends. How sweet is that? You can include a gift card to any local restaurant to go along with this teacher gift card printable. Cute creative juices printable and teacher gift idea. Most of us have a Target nearby and there are tons of ways to spend the gift card: clothing, food, home decor, craft supplies, electronics, and so much more! If the teacher you’re buying for is a fan of puns, this one is perfect. Such a creative Target gift card printable for teachers! Another cute Target gift card printable! These teacher appreciation printables inspired by Pinterest are super funny and there are a variety of gift cards that would go along with each one. Did you know you can get all sorts of gift cards on Amazon? That makes it even easier to buy gift cards for teachers, there’s no need to even go to the store anymore! Thanks for sharing your awesome printables, Alpha Mom, Skip to My Lou, Tatertots & Jello, Landee See Landee Do, I Am Momma Hear Me Roar, and Eighteen25! Making it easier for the rest of us not-as-creative people to give cute, thoughtful gifts one printable at a time! 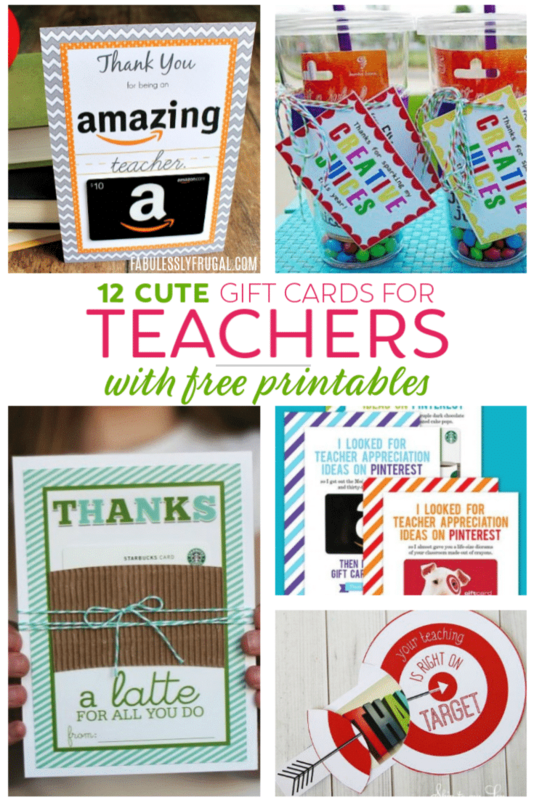 This is a fabulous roundup of teacher appreciation gift card ideas. Thank you Melanie! You’re welcome and thank you! I love these ideas. I think I might just do gift cards every year for every teacher! Thank you so much for featuring my Target gift card printable! I love all of these ideas… great roundup! Thanks for allowing us to share it. 🙂 Such a great printable! These are absolutely wonderful and the gift cards you chose for designs are exactly what every teacher loves to get. Thank you for sharing! These are absolutely awesome and a life-saver. Thank you SO much!! I love all of these! I am trying to print the Amazon one, and it keeps printing out blanks. I am not so computer savvy, hubby is stumped, too. Any ideas? Thank you! Here’s how I like to do it (hopefully this helps): Click on the link, download the image, then go to your downloads on your computer and right-click on the image and select print. Then I print the photo as two 5×7 on one page. Help!! The “Pinterest” cards are no longer available according to the website that the link goes to! I need these for tomorrow! Is there somewhere else to get them? woohoo!!!! NM got it to work! I printed the Amazon printables off today, to give to my kiddo’s teachers!!! Thank you so much! I <3 it! Thank you, Jessica! I’m sure the teachers will love it too! Myself as well. Thank You!!! These are really great. I am looking to use the Amazon one for our school volunteers. I have been trying to re-create it, but to no avail. Would you be willing to change the word “teacher” to volunteer? Thank you this is so perfect!!! THANK YOU, THANK YOU, THANK YOU!!! For your time and sharing your AWESOMENESS with the world.